There are only two cities in the Netherlands with metro, Rotterdam and Amsterdam. Three of the metrolines in Amsterdam start/terminate at Centraal Station, so it is easy to travel along in Amsterdam with metro after arriving at the railwaystation. For Amsterdam Metro Map, go here. 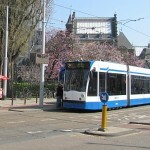 There are also a lot of trams and buses around in Amsterdam, and the best way to use these services as a tourist is either buying daypasses or the I Amsterdam Card. 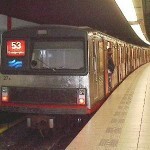 Daypasses can be used on metros, trams and buses, day and night unlimited. The price for a 24-hour pass is 7 Euro (as of 2010), and increasing with around 4 Euro per day after this. I Amsterdam Card is the pass to buy for those planning to do some serious tourist work. This card gives you discounts on many museums, free public transportation, free canal cruise and more. The price for 1 day is 38 Euro. You can order this card online from Viator. There are quite some other options when it comes to different ticket possibilities (strip tickets, single tickets, stop/go tickets and so on), but these are the easiest to use and not at all that expensive.